Tour around downtown, Mexico City. You ride down Reforma Avenue, built by the emperor, Maximilian, along which some of the most important monuments in the city are located; Juarez Avenue, along La Alameda Park and Bellas Artes Palace, designed and erected by the Italian architect, Adamo Boari; then 5 de May Street, until reaching the main square or Zocalo.At this last site, you will visit the National Palace, current seat of the government, which walls are decorated with frescoes by Diego Rivera, one of Mexico’s great contemporary painters; the Cathedral, a living example of colonial architecture; and the Templo Mayr (Main Temple). 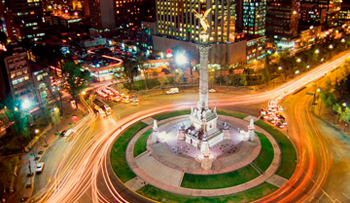 Later, the tour takes you to Chapultepec Park, driving through Las Lomas residential area, one of the most high-end neighborhoods of the capital city.